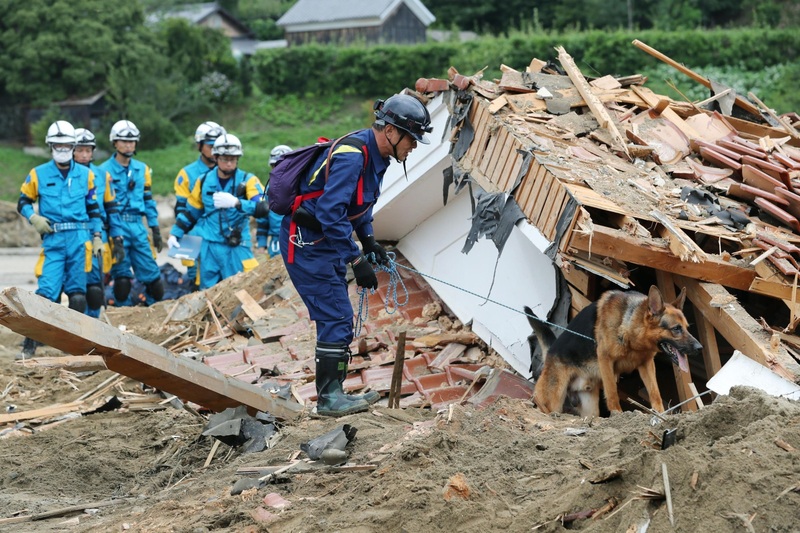 FUKUOKA - The death toll rose to 25 on Tuesday as efforts continued to find the missing after torrential rain hit parts of Kyushu last week, with more than 20 people still unaccounted for. 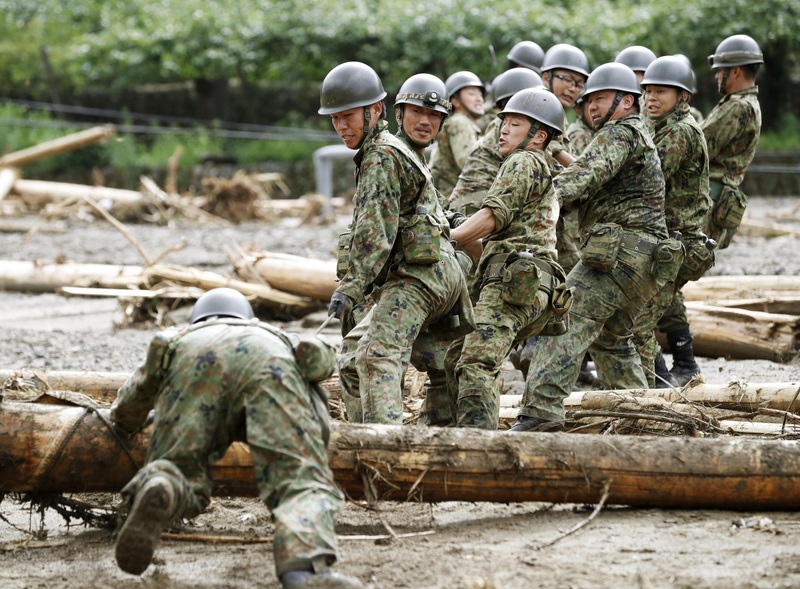 About 2,000 Self-Defense Forces members, firefighters and others were engaged in search and rescue operations in Fukuoka Prefecture’s Asakura, one of the hardest-hit areas. Following the torrential rain, which began last Wednesday, about 1,500 people remain in evacuation centers in Fukuoka and Oita prefectures, according to both prefectural governments. 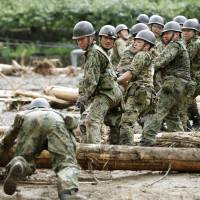 The Meteorological Agency said heavy rain is expected in some areas of northern Kyushu through Wednesday morning. 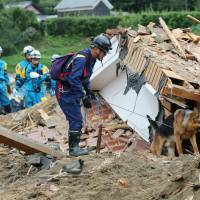 The Fukuoka Prefectural Government identified 79-year-old Yukitoshi Sakamoto from Asakura as one of the newest victims of the disaster. He was among five men and women whose bodies were discovered on Saturday in the Ariake Sea, situated several tens of kilometers from the disaster-stricken area. Since areas along the Chikugo River flowing into the sea include locations hit hard by the heavy rains, the bodies may have been washed downstream. The prefecture also identified two female victims found in the city as Hatsuko Kojima, 69, and Sachiko Murayama, 80. The city government of Asakura is devising a plan to build temporary housing for people affected by the disaster. It also planned to equip evacuation centers with air conditioning to prevent heatstroke as temperatures in the city were expected to exceed 30 degrees. The village of Toho, Fukuoka Prefecture, where more than 40 houses were destroyed, was also planning to construct temporary housing. It also said it would start restoring water supply to some of the affected areas where over 900 households have been left without water. Road access to the area isolated due to torrential rains and mudslides was restored Monday night. Meanwhile, the city government of Hita, Oita Prefecture, said it was planning to provide free public housing for evacuees. Rescue teams deployed helicopters to deliver food and medicine to people in the city’s Ono district, cut off by mudslides. The city government said it would take several days to reopen the road connecting the area with other parts of the city.